Improvisation is key to running any roleplaying game. It's an essential skill for every game master and player, and can mean the difference between a good gaming session and a great one. Until now, there hasn’t been a system-neutral book that covers improvisation for game masters from every angle. Unframed: The Art of Improvisation for Game Masters is that book. An anthology of 23 essays by a diverse group of award-winning authors, designers, and experienced game masters, Unframed gives you the tools and inspiration to improvise better, "wing it" without hesitation, and get killer results. 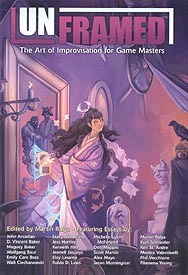 Inside this book you’ll find advice on improvising dialogue scenes by Robin D. Laws (Hillfolk, Ashen Stars), a look at "Just In Time" improvisation from Jennell Jaquays (Caverns of Thracia, Dark Tower), advice on listening to your players by Jason Morningstar (Fiasco, Durance), tricks for handling curveballs from Jess Hartley (Changeling: The Lost, Geist: The Sin-Eaters), tips on improv in horror games from Kenneth Hite (Trail of Cthulhu, GURPS Horror), insightful essays by the authors of the ENnie Award-winning game mastering blog GnomeStew.com, and many more. Unframed collects the wisdom of 23 top designers and gaming industry veterans, and offers 23 perspectives on improvisation. Running the gamut from old-school to indie, and featuring tips specifically for game masters as well as techniques any gamer can use to master the art of improvisation, Unframed has you covered. Whether you want to create a social sandbox, get better at doing voices, or harness the power of "yes, and," you'll find the improv advice you’re after in Unframed.